At first glance, Beata seemed a little intimidating. The pristine and awe-inspiring appearance of the building was far better than anything he'd ever known. How is she affording this? He thought of his mother back at home, now all by herself. They had never been very 'well-off'. Dad had left before he could ever be born and so it had been his mother that always supported him. The two of them had been on their own for as long as he could remember. It was the first time in his life that Matty would be off on his own. Part of him felt bad for accepting the scholarship to come his, but his mother had insisted on it. She always pushed him to take any opportunity, no matter what that entailed dealing with on her end. She had been a fantastic mother. A pang of sadness caused him to frown slightly as he stepped through the gates. But this was life now. He made a mental note to call his mom later once he had settled into the dorm room. Once he'd made to the front of the building, Matty dropped his couple of duffel bags to the dusty earth. Both were very clearly worn, and neither was too stuffed. There wasn't a ton to bring along, nor did he feel like he needed much. On the boy's back was an equally used guitar case. The instrument itself, on the inside of the case, showed months and hours of wear as well. Not much that he owned was new. Under the shadow of the building, he felt so small and out of place. There would clearly be a variety of students here with much more wealth than him. It had always been a touchy subject for him. Being in a fairly low-middle class home with a single parent had really made him stick out at school, despite his attempts to keep a low profile. There was no doubt Beata would be the same. He shoved his hands into his pocket and just stood there for a moment. Everything was promising to be so different now. Matty still had no real idea why he was here. All that he knew was that something was wrong with him. There had been some jocks screwing with him during free period. Once moment Aaron Jones was standing over him, and the next he had been thrown across the room. Matty hadn't laid a hand on him. Within a few minutes, he had been sent to the principles office and then home. His mother had been contacted by Beata as soon as they heard about the incident. And within a few days everything had been settled and he'd been shipped off. It seemed a bit surreal. Typically, he was the kind of person to just take things as they came. This would have to be no different. After a moment of staring at the academy, Matty shook his head and gathered up the bags again before throwing himself back onto one of the benches. It had been a long journey, and he was in no rush to stuff himself into a dorm room quite yet. Besides, it was a nice day. Closing his head and leaning back, Matty put his hands behind his head and relaxed under the heat of the noon day sun. Anne didn't like spending the days outside. She had come to the gruelling truth that she must be turning into a vampire and that sooner or later she was going to have to drink the blood of one of the other students. She crept around, pressing her red-rimmed glasses on her nose and sticking relatively close to the shadows cast by the large trees in the school garden. Her bare feet swished in the wet, clipped grass as she strode on, taking in lungful of air to sufice to the months of time spent indoors crunching up paragraph at the light of her computer screen. She was nowhere near actually having the skills of a writer, but she was still dreaming, scrapping and re-doing her work constantly. She halted as she neared the gate, the scorching heat of the pavement almost calling out to her. To continue her stroll she would be forced to go through there. Uneasily she rubbed her heels to her ankles. She could fix her skin if it got burned, but her power was an exhausting process nonetheless. I can do this! she urged herself, and the young girl took a running start and broke away from the shadows onto the entrance pathway, trying to sprint quickly across it. Her foot hit a lose tile and the Summer flew off her feet and stumbled. She groaned, rolling on her back, too stunned to register the burning feeling in her feet. A light shadow was cast on her and she shielded her eyes to find a guy and his bag before her. "Oh. Sup newbie?" Anne tried to keep her cool, avoiding his gaze. At the sound of another student's voice, his eyes opened slowly too look down at the other student. She was definitely younger than him. A half-grin quickly appeared on his face. She seemed like a half-decent human being at least. He sat up and then leaned forwards, clasping his hands together as he replied, "Are you okay?" His tone was light, trying to keep a joking mood over the more concerned undertone. It didn't seem like an awful fall, but nonetheless, he had to ask. Without getting up, he outstretched a hand to grasp hers and pull her upright. The way she tried to avoid his eyes was obvious. He hoped that by being his warm and kind self would put her more at ease. It was rare he was this open with others, but younger kids were always his weakness. There was something about their innocence that put him at ease. "The name's Matty. Matty Waterson Jr. What's yours?" He beamed at her, flashing a white-toothed grin. Strands of dirty blonde hair just barely fell over his dark brown eyes. He was used to the feeling and didn't feel the need to brush them away. Anne tooked his hand and propped herself up. A osrt of embarassment was still flowing through her, but the other person was at least being kind about it. She shot him a hurried not as a thank you, shaking off dust from her plain clothing. "Umm, thanks. You new around here? I can show you around. You know, in exchange." the Summer offered, smiling. No reason to not be kind today. Appart from the heat burning in her feet every second from standing around... She yelped in realization and began hopping from leg to leg in an attempt to cool of her heels. No luck. "Let's go already!" she said, her voice more alarmed than decisive as she led him awayt owards the school. He simply nodded at the offer with another encouraging smile as he noticed how embarrassed she looked. It seemed like the next moment he was being pulled onto his feet. She sure was enthusiastic. Matty just barely grabbed his duffel bag that had been dropped next to him. He followed after he with the bag in one had, guitar slung over his back, and his other hand in his pocket. His eyes glanced at everything there was to see around her. 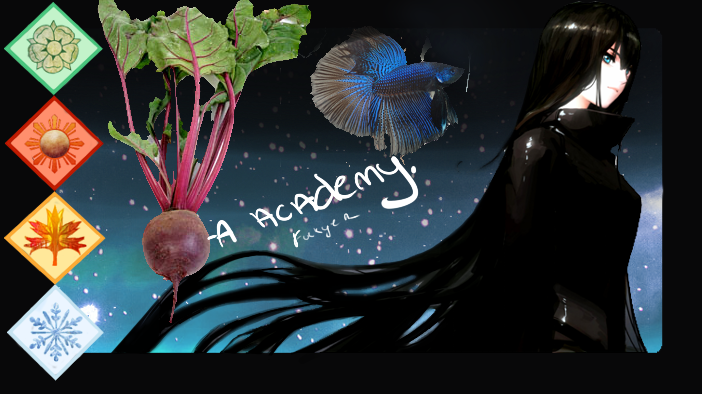 Beata Academy was truly a magnificent looking place. Once more he realized how small he felt against the imposing school structure. Realizing he still didn't know her name, or much else about her, Matty asked, "Have you been here long?" "Since April. So yeah, been a while." Anne said over her shoulder, peering curiously at his guitar case. She'd played an instrument, except for the piano lessons that every kid tended to undergo in 1st grade and drop out of a few years later without remembering anything about music. It was quite impressive the kid owned a guitar seeing the state of his bags. "I'm Anne-Marrie, but call me Anne for short." she continued, smiling, remembering she'd forgotten to introduce herself. The Summer stopped in the shade cast by the school entrance, the stone stairs bearing the warmth of being bathed in sunlight a few hours beforehand. She leaned against the wall, looking at one of her scraped knees. Putting a small pale hand over the injury, the small glow of white light emerged from her palm and the wound was gone gone fast, no scar to bear. Adjusting her glasses, Anne-Marie stood up again and tilted her head towards the entrance. "Let's go." "Nice to meet you, Anne." He said with a brief smile. Matty followed after her. The boy longed to stick his hands in his pockets and casually enjoy the warmth of the day, but it was hard when he was still toting all his stuff. His guide paused for a moment. For a brief second the new student thought they would be stopping for a while as she gave some sort of explanation about the school. But, instead, she caused his jaw to drop. The scrape on her knee vanished. It was as if she had never been harmed in the first place. Matty looked down at her with widened eyes. This certainly was a special place. From what he had heard, everyone here was different; they all had different gifts and abilities. Briefly glancing at his own hands, he wondered what they held in store. Prior to being sent off to Beata, Matty had never known anything of powers. No one in his family had they. Maybe it was from his father's side. "Huh." Was all the response he could managed before she continued on. He hefted all of his stuff once again, forgetting his thoughts about his unknown father. Well, not entirely unknown. His name was obvious, the one the shared. After a moment, he finally regained the ability to speak. Matty spoke up, looking down at her again, "Any chance you could show me where the dorm is? Carrying this around, while good exercise, might be a little troublesome."